Apply to join a Coalition Group - The coalition groups work directly with their member growers to assist in complying with requirements by conducting monitoring and preparing regional plans to address water quality problems. Obtain Coverage under Individual Waste Discharge Requirements - This option is for dischargers who wish to obtain regulatory coverage under the Waste Discharge Requirements General Order for Discharges from Irrigated Lands within the Central Valley Region for Dischargers not Participating in a Third-party Group. Under the Waste Discharge Requirements, growers are required to prepare farm plans. Templates approved for Farm Evaluation, Nitrogen Management Plan, Nitrogen Management Plan Summary Report, and Sediment and Erosion Control Plan will be posted here once available. The location determines which template should be used. Please see the map below to help you determine which template applies to your parcels. The template is approved for the California Rice Commission (only) and applies to Rice Growers in the Sacramento Valley. 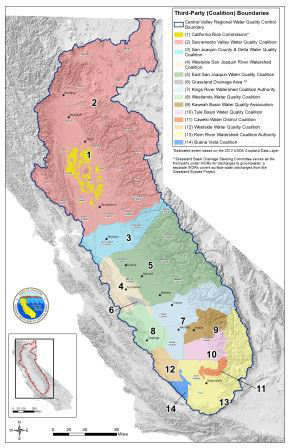 The NMP and NMP Summary Report templates are approved for all Central Valley Water Quality Coalitions (does not apply to the California Rice Commission). Members in all coalitions (except for the East San Joaquin Water Quality Coalition) are required to use these templates. The INMP and INMP Summary Report templates are approved for all Central Valley Water Quality Coalitions (does not apply to the California Rice Commission). Currently, these templates must be used by East San Joaquin Water Quality Coalition members in place of the NMP and NMP Summary Report templates. Starting 2020, members in all coalitions (except the California Rice Commission) will be required to use the new templates. The template is approved for all Central Valley Water Quality Coalitions (does not apply to the California Rice Commission).